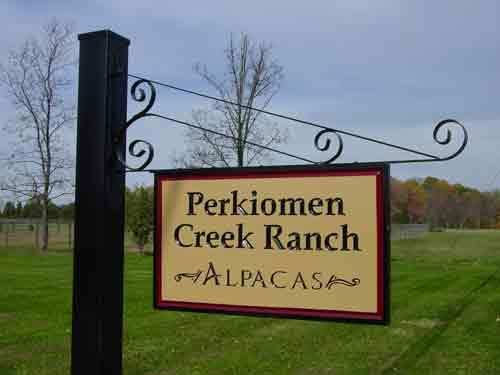 Welcome to Perkiomen Creek Ranch. Great for mittens, hats, sweaters, and vests! Our yarn colors range from gray, brown, multi-color, etc. We also have second cuts for felting! Call us at 610-754-8954 for your needs and shipping address. Shown in the lower left is a Rose Grey 2-ply yarn from Perkiomen Amidala. In the lower middle is a 2-ply yarn combined from Perkiomen Legolas and Mystery's Star. In the lower right are medium brown rovings from Marlarque's Crimson Flame. We focus on breeding and selling award-winning high-quality huacaya alpacas. Our philosophy is that raising alpacas is a joyful experience. They should be as fun and wonderful to interact with in the barn as to watch in the field! 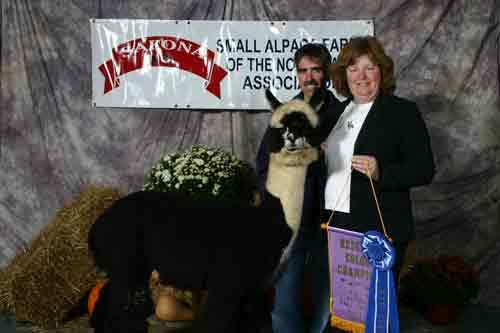 Athena won a blue ribbon in the MAPACA spin off class for Grays. Her fleece has an excellent soft handle and is great for spinning. 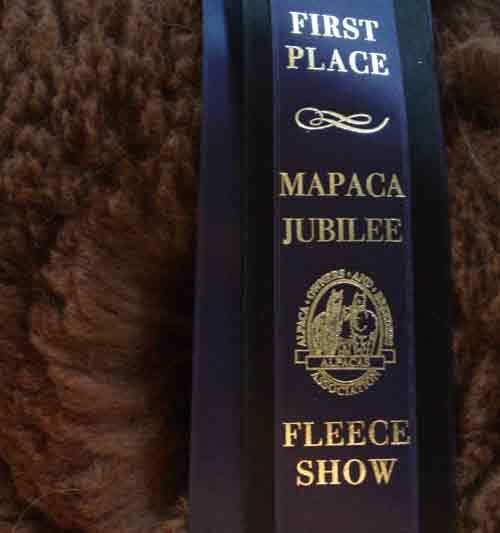 Perkiomen Pioneer took a blue ribbon in the MAPACA fleece show. His fleece is the finest in our herd. Contact us for breeding opportunities. To view the before and after shearing pictures, click on this link. 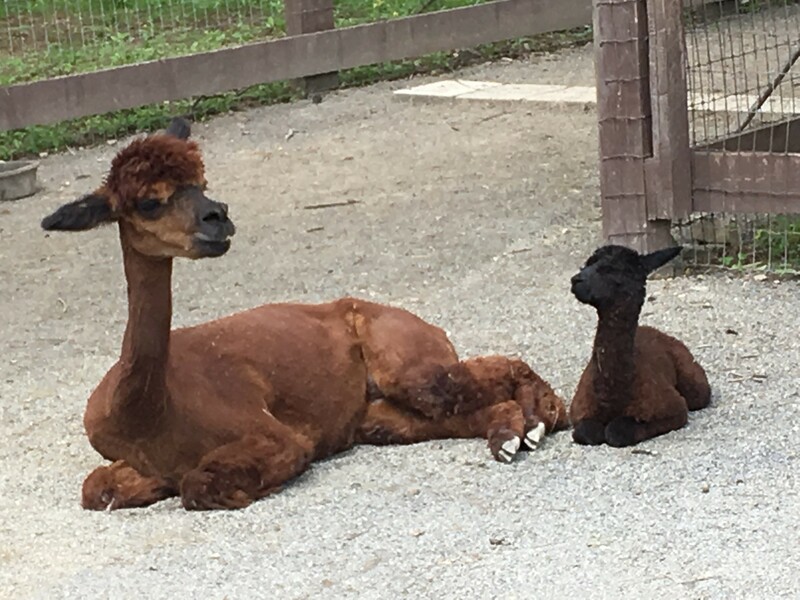 Come visit our alpacas! We have 11 girls and 7 boys. Here is our latest baby, Liberty. 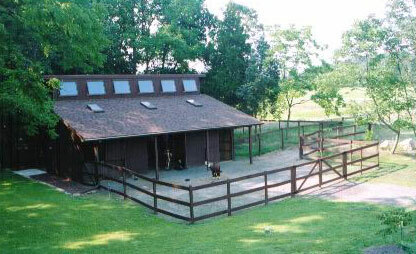 We are a family-owned alpaca ranch. Our prior 20 years of experience with dairy cows and chickens have provided us with a solid foundation on handling livestock. 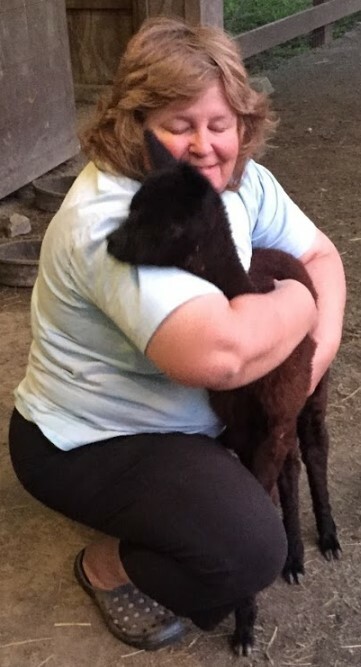 Alpacas, officially categorized as livestock in the state of Pennsylvania, are truly huggable investments, easy to maintain, and entertaining to watch. In the evenings, we enjoy spending time watching them graze, run around, and play. We refer to them as large curious cats. Alpacas, as we know them today, originate from South America, mostly from Peru, Chile, and Bolivia. They are related to llamas and are members of the camelid species. The fineness and handle of the alpaca fleece makes it a desirable source for clothing. Please visit our herdsires page for breedings. Three of our foundation females have also performed well in the show ring, notably Marlarque's Crimson Flame, RRA Solomon's Nathalie, and Perkiomen Padme.